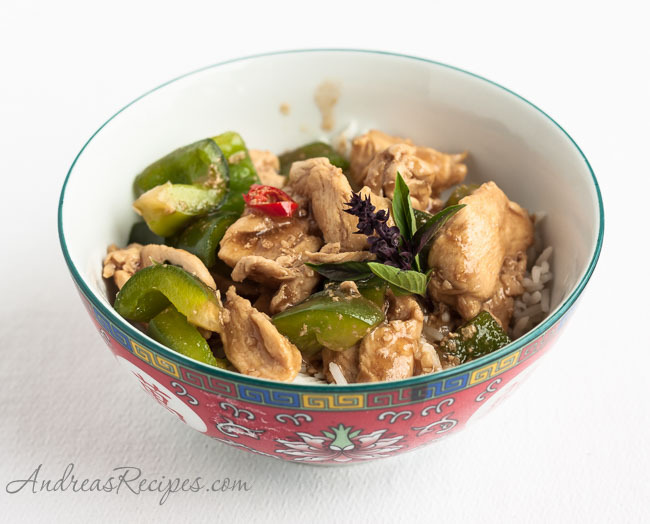 This dish is the main reason we grow Thai basil in our herb garden. We’ve grown many kinds of basil over the years and seem to have settled into a routine of Genovese, Lemon (Sweet Dani or similar), and Thai (Sweet Thai or Queen of Siam) basil because they cover the spectrum of our uses. The Sweet Thai variety we grew this year produces plants with purple stems and gorgeous purple flowers. Like most basils, the flowers are also edible and add a punch of anise flavor to Asian dishes. Our basils will last a few more weeks, then it will be time for the final harvest of the season and a marathon session making pesto (basic and sun-dried) and basil ice cubes. The peppers, basil, and garlic all came from our garden. You might wonder why the peppers are dark in this photo but green in the finished dish. 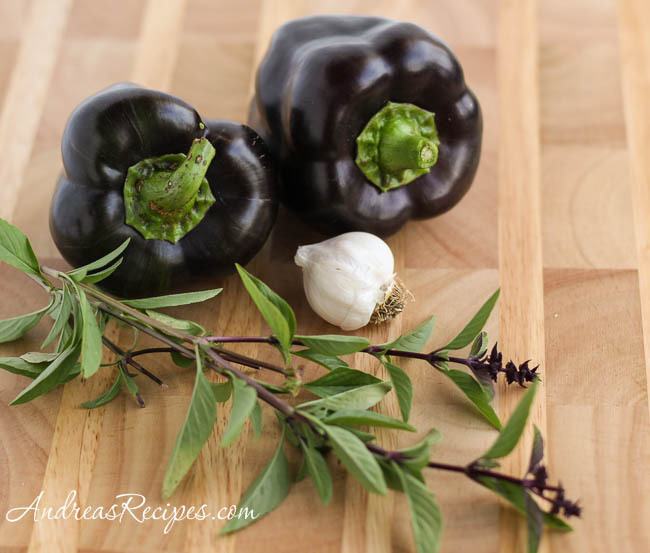 These dark peppers are called Purple Beauty, and as you can see they ripen a deep purple, almost black. The inside remains green and when cooked the skin looses its lush color and turns back to green. The substance that causes that deep purple color, anthocyanin, is a powerful antioxidant that is also water soluble, hence the change in color when cooked. None of our red peppers were ripe when we made this dish recently, so we used the Purple Beauty, but they definitely provide greater health benefits when eaten raw. When making this dish for people who enjoy some heat, go for the full amount of hot peppers. This meal has to feed all the eaters in our home, including the little guys, so I hold off on the hot chiles, just adding a few slices with some seeds to the wok. Michael sets his mouth on fire by adding a whole sliced chile (or two) with the seeds to his bowl. I’ve adjusted the method for making this dish by starting with a cold wok and adding the garlic and chiles to the cold oil. This allows the flavor to release as the oil heats and prevents the garlic and chiles from burning. Thanks to Jaden for sharing this technique! This is my contribution to Grow Your Own, the blogging event that celebrates dishes we create from foods we’ve grown, raised, foraged, or hunted ourselves. Dido of Mowgli Chic is our host for this round, so be sure to visit her blog for more information about submitting your post. If you are new to the event, you can read more about the rules for participating at the Grow Your Own page. Also, be sure to check out the most recent Grow Your Own roundup at Masala Heaven, which was hosted by Praveen. andrea i love thai basil. it’s got the lovely lemony liquorice flavor and really adds a wonderful touch to any dish it is used in! I love Thai basil! In fact, my favorite thing to order in a Thai restaurant is a dish with ground chicken, peppers, and Thai basil. This sounds like it would taste heavenly! yum, this looks so tasty! i will definitely have to try this at home, especially after having this dish in thailand recently! We love love love basil and Thai food. Great photo in the lead shot. We are ready to do the final harvest too, but have a bunch of seedlings that are about 4″ tall that we are going to try to grow inside this winter. We have a french door with a lot of light and from what we’ve read, we might be able to keep them at growing temps. Gorgeous flavor profile, Andrea. This dish looks way better than it does in most Thai restaurants! Beautiful photograph.